Forecasts for low temperatures supported both the near and far curves. Rising prices across the wider fuels complex provided additional support for the UK power curve. UK market is well supplied with gas compared to recent years, with further deliveries on the horizon. Wind output averaged nearly 7GW across the week; close to 45% of the generation mix at its peak. 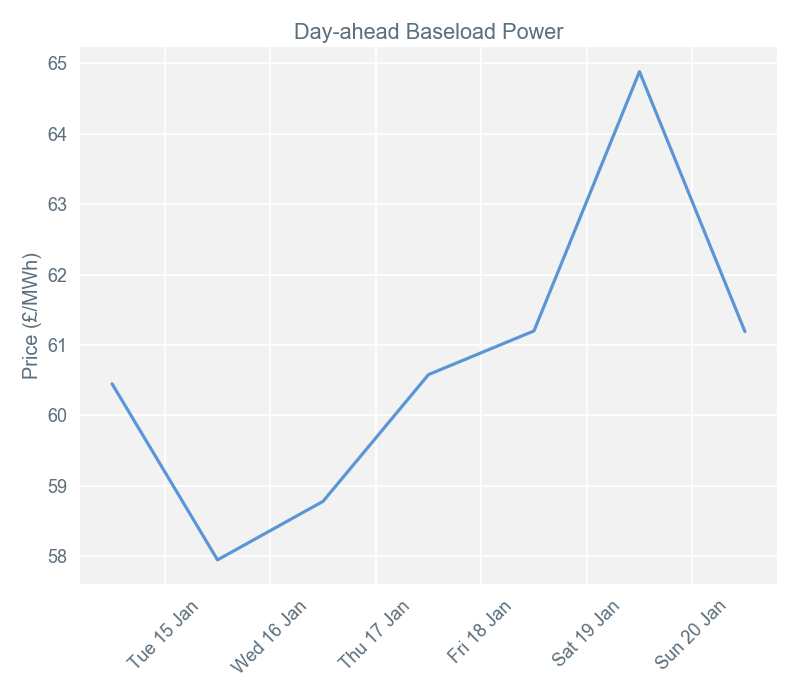 High wind output, boosted by cold weather forecasts, pressured day-ahead power prices over several days during week 3. With wind generation expected to be much higher on Tuesday 15th, day-ahead prices softened and remained largely flat for delivery on 16th. 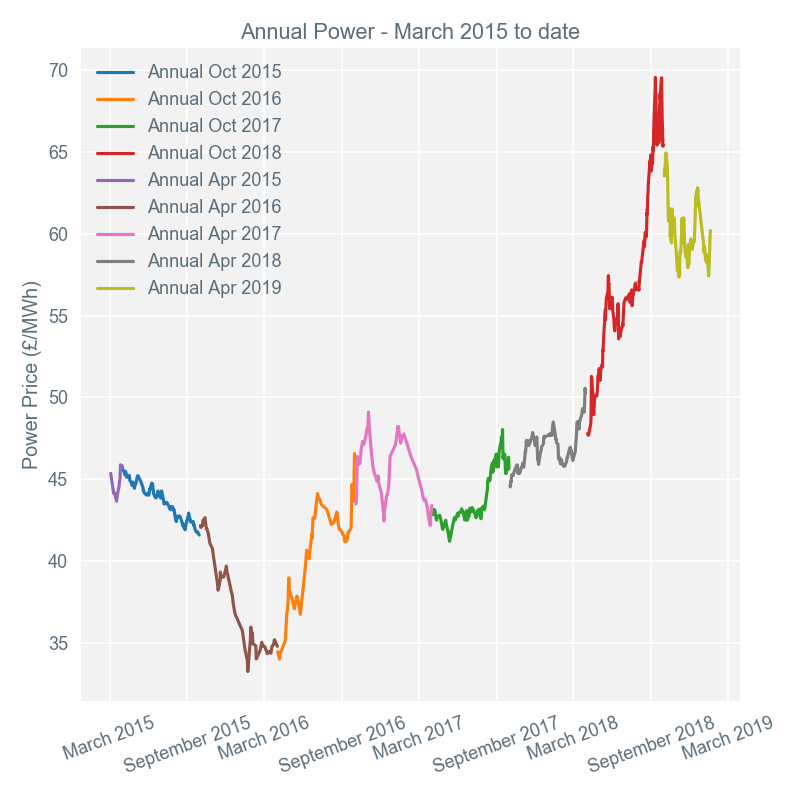 An increase in price of almost £2/MWh for delivery on 17th could be attributed to colder weather forecasts raising the National Balancing Point (NBP) prompt. Further bullish sentiment was present in the prompt market during trading for delivery on 18th. Cold temperatures and a decline in wind generation boosted the NBP day-ahead products, pulling power prices with them. Colder temperatures put additional pressure on supply margins, and resulted in the use of more expensive thermal generation and higher prompt prices. Generally, the UK is relatively well supplied right now, with cold weather forecasts less severe than many thought, and an abundant gas supply. Gas storage levels in Europe are up on the same point in recent years, and additional Liquid Natural Gas (LNG) vessels should dock in the UK before January 31st. In addition, the return to service of several nuclear units (raising capacity from 5GW to 7GW) has provided extra margin. 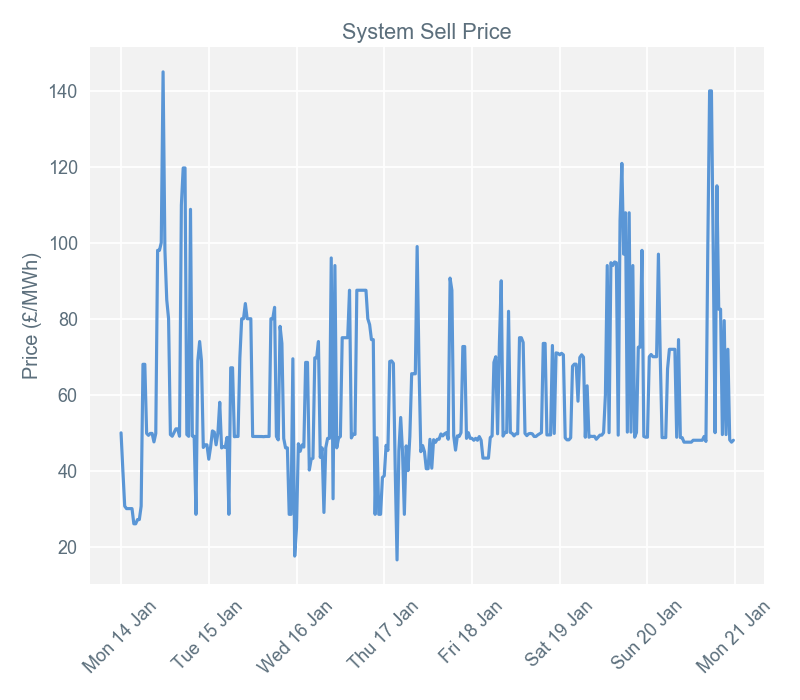 Imbalance prices peaked at £145/MWh for settlement period 24 (11:30-12:00) on 14th January. This final price was set by the system operator accepting numerous offers - in increments of 5MWh, all at that price - from Dinorwig pumped storage hydro to increase generation. The lowest imbalance price for week 3 was the final price for settlement period 8 (03:30-04:00) on 17th January. During this period, the Net Imbalance Volume was over 600MWh - meaning more generation was turned down during this period than was paid to increase. The final price was set by an unknown entity, which paid £16.50/MWh to reduce volume. Despite the high wind generation output on several days during week 3, there were no periods of negative prices. 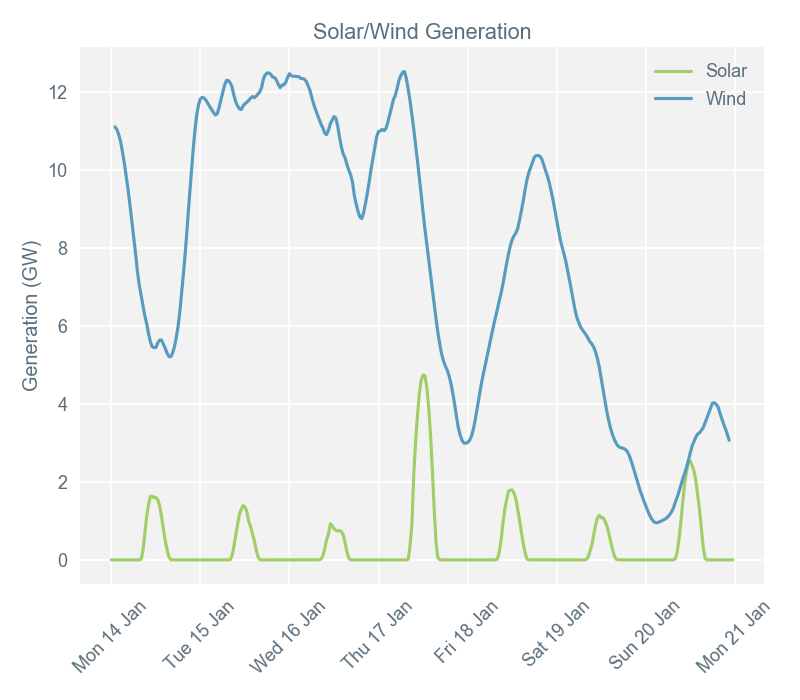 Wind output averaged nearly 7GW across the week, making up close to 45% of the generation mix at its peak. High wind levels on 15th January pushed out some of the more expensive coal and gas-fired plant from the fuel mix, reducing carbon emissions. Output from solar photovoltaic (PV) installations peaked at 4.7GW at around 13:00 on 17th January. This made up 10% of the generation mix and reduced demand in the middle of the day. 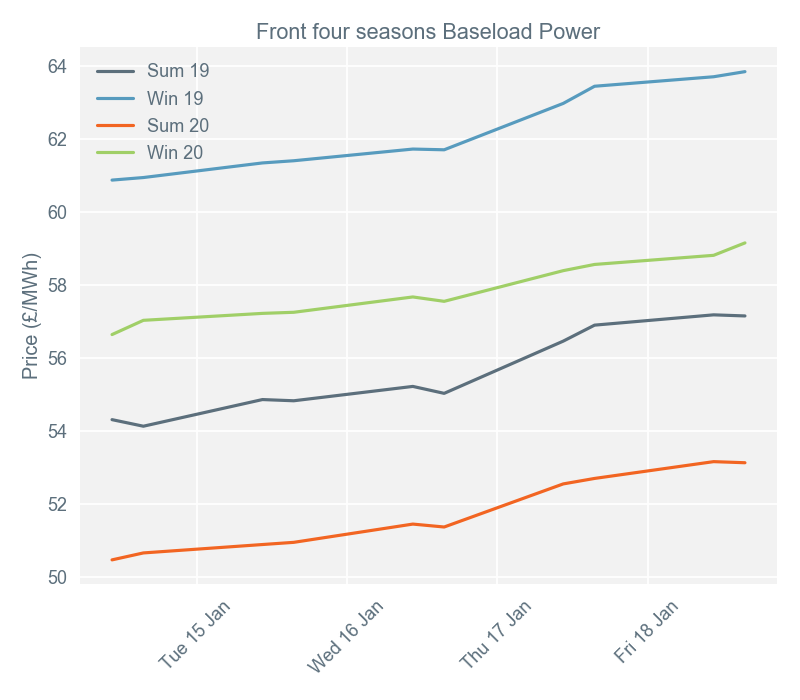 Secure and promote* (Seasons +1, +2, +3, +4) baseload contracts all saw gains of over £2.50/MW between their opening price on 14th and the closing price on 18th January. Contracts took a slightly bearish turn on 14th, but were on an upward trajectory for the rest of the week. One of the main drivers behind these price gains was the impending cold weather strengthening the prompt and filtering down to products along the curve. Additional strength came from the wider energy complex, with carbon the most bullish part of the energy complex. Carbon prices rose throughout week 3, almost reaching the level achieved at the end of 2018. The European coal benchmark also ticked up throughout week 3, supported by bullish oil (which influences those prices due to the cost of transporting coal).